I was writing it while it was happening, and now I’m married to him. Blog version here. 1. Have you ever been the “other woman” (or “other man”)? Yes – for a time. I was young and thought I think that he would eventually be in love with me. 2. What is the craziest thing you have done in the name of love? Getting in a car and driving to Tennessee to see if it was real. 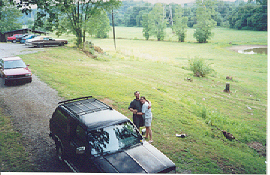 The first picture of us together, during the fateful trip to Tennessee. 3. Is there someone who you think of as the one who got away? 5. Have you ever experienced love at first sight?